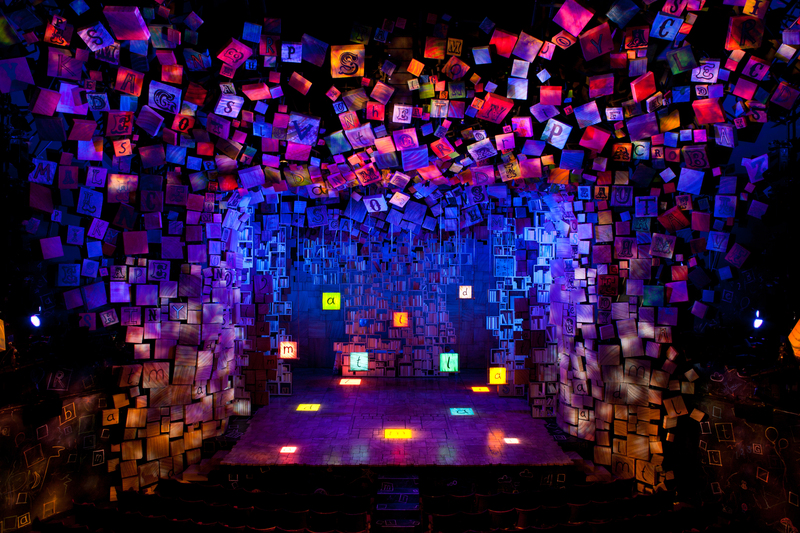 Indeed, Howell played that “board” very well, winning a Tony Award for his wildly inventive and original sets for Matilda, the story of a intelligent young girl puzzling her way through a world of parental abuse and magisterial injustice. 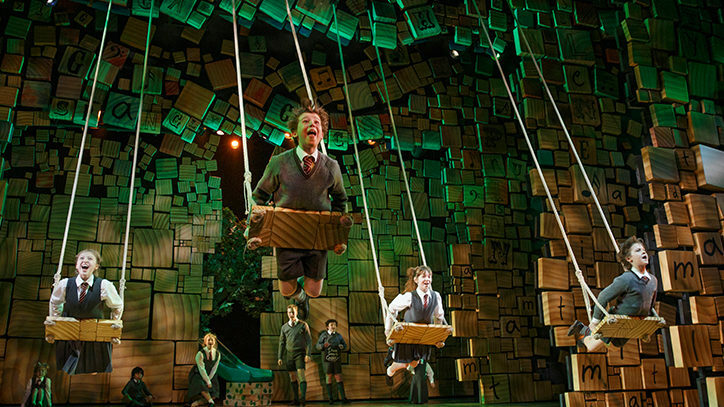 Upon entering the Shubert Theatre, audiences are greeted with a jumble of wooden tiles of varying sizes and color, signaling the anarchy that is to come in the form of the loud and brash Wormwoods, Matilda’s zany family, and the pathological craziness of her nemesis, Miss Agatha Trunchbull, the headmistress of Crunchem Hall. While there is a certain ominous threat in the air, Howell immediately cuts through it even before the show begins. The set designer has puckishly hidden various words in the tiles that spill out from the proscenium arch, including his favorite: B-U-R-P. It’s a high-scoring one with the children in the audience. 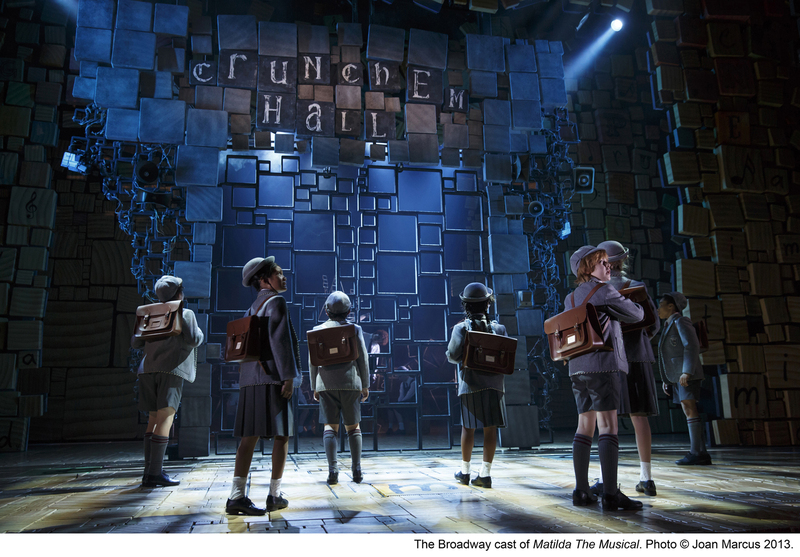 The designer says that at first he was stymied when first tasked with providing the touchstones of Matilda’s journey. He spent years going down the wrong path in attempting to construct that world out of desks and blackboards. “When I added color to them, they lost their potency as objects,” he said. In growing frustration, he chanced upon the brilliant idea of alphabet tiles which not only had the warmth of familiarity but also retained their power when tinted with color and sized proportionately. The crucial three-dimensional depth was in no small measure enhanced by Vanstone’s lighting. The relief from the menace of Crunchem Hall for both Matilda and the audience comes in the form of Howell’s simple designs for the home of Miss Honey, the teacher who comes to her rescue, and the library where Matilda’s finds solace in books and in the sympathy of the librarian, Mrs. Phelps. Originally designed for the thrust stage of the RSC’s Stratford theatre, Miss Honey’s home could have no walls instead settling for an impressionistic design that conveyed a warm haven from the chaos. When the production transferred to the proscenium stages of the West End and Broadway, Howell eschewed the opportunity for a re-design. “We stumbled upon it for technical reasons but it seemed right for the simple laidback esthetic for Miss Honey,” he says. Likewise for the library. The designer says that he wanted it to be a refuge of “spiritual calm and tranquility” for Matilda. Given the frenetic and brassy world of the Wormwoods, “it was like being out in Times Square and coming into a chapel,” says Howell. That outre invitation extended, of course, to Trunchbull whose outrageous totalitarian outfit of brown coat and britches was taken in part from the original illustrations that accompanied Dahl’s novel. The costume, in fact, was based on a real one worn by a close friend of the writer’s, a certain horticulturalist who went by the name of Beatrix Havergal. 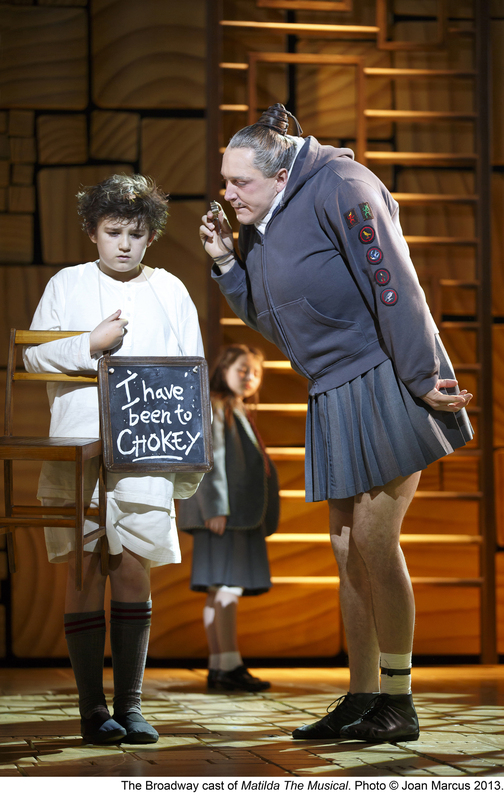 Trunchbull’s other costume, one which invariably elicits howls of delight from the audience, is what the designer describes as her “gym kit.” In a hilarious scene, Miss Agatha doffs her gym jacket to reveal two large misshapen breasts jutting from what appears to be a sports bra combined with a weightlifting unitard. Howell said that he left it intentionally ambiguous. “It would be a shame not to recognize it as something we might have seen before and yet not be able to exactly place it,” says Howell. Indeed, that seemed true of all of his designs for the show: familiarity mixed with a totally original iconoclasm.